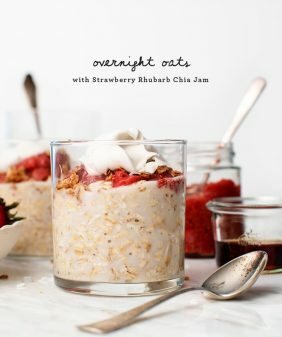 There are some food trends that I wish would end (sorry, oatmeal). There are others that I hope never end – like avocado toast. In my opinion, this one’s not going anywhere simply because avocados are awesome. And I’m totally fine with that. A few months ago, I posted a fall/winter version of my favorite smushed green snack and now here’s my spring take on the classic. I love the sweet/salty/creamy combination of avocado, coarse sea salt and strawberries. 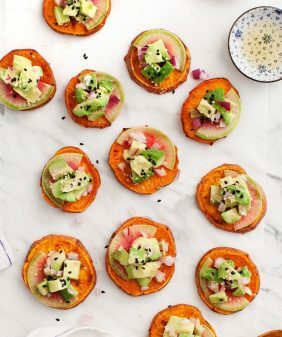 These are a delightful little appetizer bites (or, for me, lunch), that take 2 minutes to put together. Don’t forget the fresh basil! Place the strawberries in a small bowl and toss with a small drizzle of balsamic vinegar. Let sit for 5 minutes. 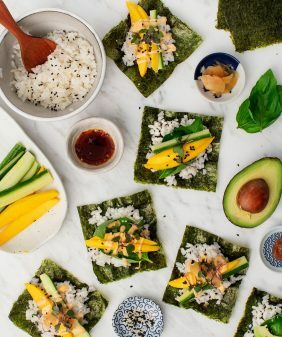 Slice the avocado in half, then score into cubes. Add a squeeze of lemon and a pinch of salt right into the avocado. Scoop it out and use the back of a fork to smash it onto the toast. 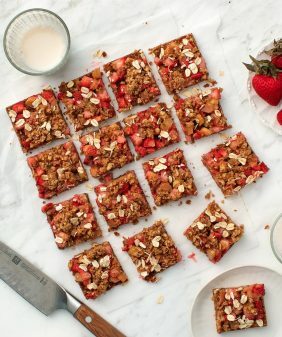 Top toasts with strawberries, basil, a sprinkle of hemp seeds, if using, and more sea salt to taste. This is wild. I would never have thought to put strawberries with avocado. I’ve always been a great fan of salt with avocado and strawberries and toast but who knew they could be combined! I’m definitely trying this out over the weekend! Thanks for the post! Wow this sounds incredible! 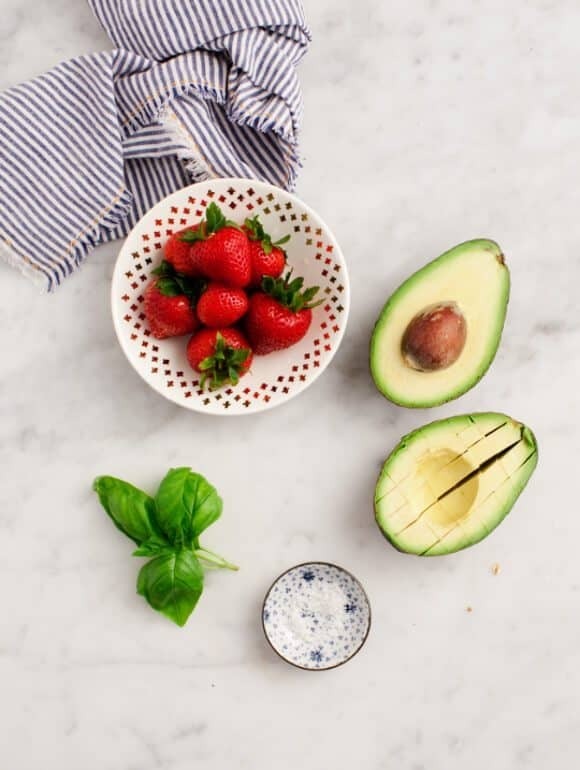 I’ve put strawberries in my guacamole before, but I never thought of doing it as avocado toast AND with the fresh basil. Genius! This looks divine! I love avocado and strawberries, and I see no reason why they won’t be amazing together. This is totally the kind of thing you can eat for any meal. I love the strawberries on top! Here’s to hoping avocado toast NEVER goes out of style. And even if it does, you can trust that I will still be scarfing it down. LOVE the idea of adding strawberries and basil. 3 of the greatest foods on earth coming together? Heaven in a mouthful. Where did you get that kitchen towel? I love it! I haven’t tried it yet, but I’m sure I will love this combination! 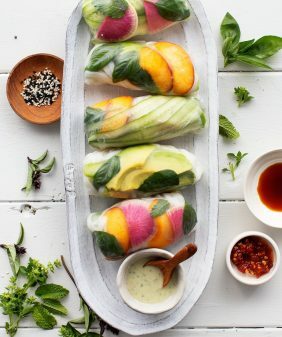 One of my favorite avocado partners is sweet, ripe mango; basil or cilantro works well here. I always add them to salad…haven’t tried toast. My girlfriends has wheat intolerance, Can’t wait to try this tomorrow. We make our own bread as gluten free is so expensive. 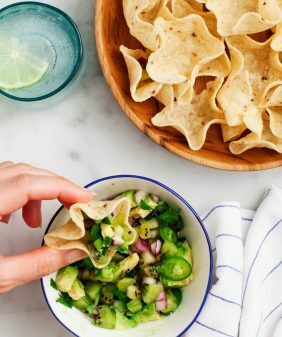 This is a delicious snack with a chilled glass of wine. Instead of fresh strawberries, I just made homemade jam and used what I had on hand. Perfect combination of sweet, sour, and salt! These look wonderful! They are going to be a hit with my kids! 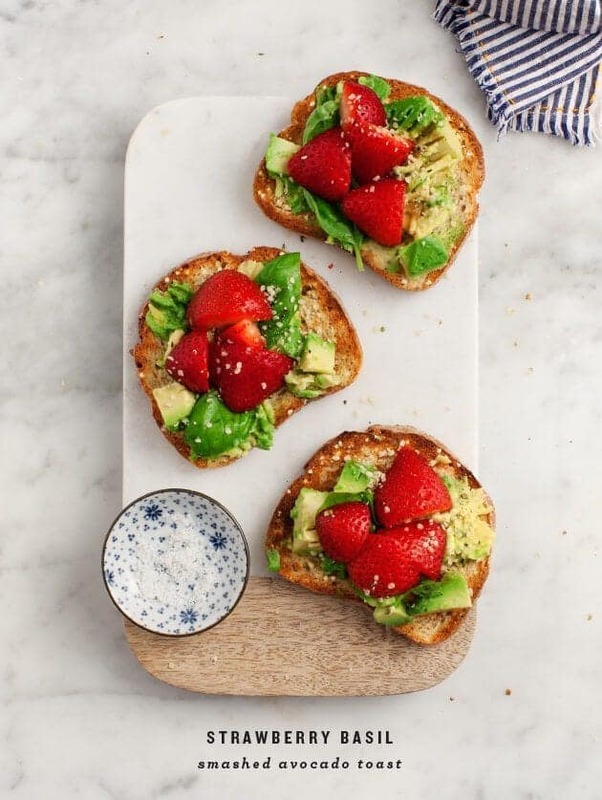 cannot get enough strawberries….lol or avocado toast. so this is perfect!! Just so you know, I’ve been making this every day since you posted it! Just seems so fresh and tasty. Especially with our local strawberries being ready to pick! I made this today for breakfast, and it was absolutely delicious. So, I bought your cookbook! Can’t wait to try more of your recipes. I was looking for such interesting appetizers for my bitrthday party. It looks so delicious! Basil, strawberry and avocado! I would hve never thought of it!